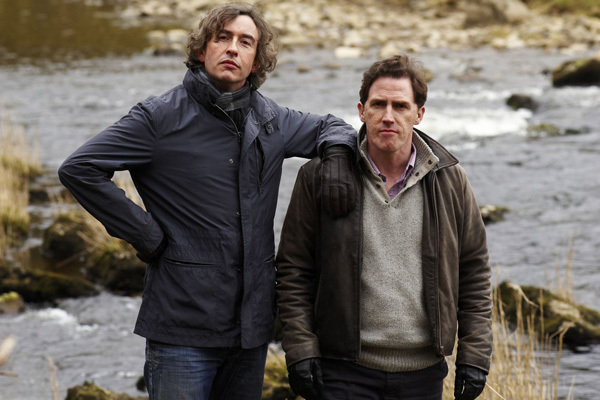 Actors Steve Coogan and Rob Brydon play fictional versions of themselves on a road trip across the North of England. Steve is struggling for work in film and his girlfriend, Mischa (Margo Stilley), has separated from him to return to America. He was expecting her to help him on an assignment he's been given: to complete six different restaurant reviews. With his girlfriend pulling out, Steve's last resort is Rob. They're not really friends or colleagues, but they've known each other for a long time. Rob prides himself on his impersonations of other people, while Steve wants to be taken seriously in mainstream movies. This sparks a sparks a rivalry between the two men as they constantly work to correct each other. The Trip initially seems like its much ado about nothing. 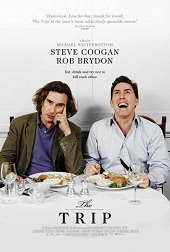 It's essentially a road movie, full of rich food and wine and two self-important, funny men. Comparisons to Alexander Payne's Sideways (2004) are genuine but this picture is largely improvised by the actors. However, an outline must have been provided by director Michael Winterbottom because beneath the silliness of the comedy a deliberately dark subtext is visible. The humour is intelligent, not because of what is said, but in how it reveals character. Both Steve and Rob are flawed in different ways. We understand why Steve's relationship has fallen apart. He's continuously jealous because he can't stand Mischa being around other men. He automatically assumes that she's involved with them. Yet he also takes the time to sleep with two women himself. Rob is a family man but seems to have the compulsive need to impress people by using the same jokes and impersonations over and over again. The duo shares hilarious chemistry together because their personas complement each other so well; Steve is too much like his egotistical self, while Rob is needlessly always trying to be other people. Comedy is at its funniest when actors find some variation on how to play their roles straight. The Trip's self-depreciative tone is perfect. Neither man has any idea about reviewing the meals. It's really just a device to give the movie a framework. But their incompetence is hysterically funny because they try to sound smarter and cleverer than they actually are, especially when outdoing each other's impersonations. Rob impersonates everyone from Michael Caine, Woody Allen, Sean Connery, Hugh Grant and even Christoph Waltz. These are enjoyable because they're recognisable and silly. But there's an old fashioned method about Winterbottom's direction that I like too. 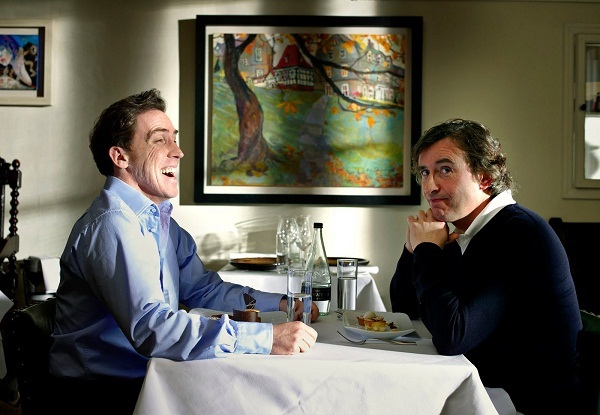 A lot of the restaurant scenes are held for a very long time, which means that the decision to improvise is a smart one. It allows both actors to play out their mimetic roles with as much time and space as they need. They can milk the gags for as long as they can, which also makes them funnier. As a drama the film is a little more weightless than Sideways, mostly because the side characters are underdeveloped. Steve can only interact with his girlfriend over the phone so there are fewer opportunities to really care about her as a character. And spreading the trip over six days instead of four or five means that the film losses some energy through its repetition. At just under two hours it could have been shorter. Nonetheless, the film is still frequently hilarious and certifies that Winterbottom is as diverse as any other working director today.